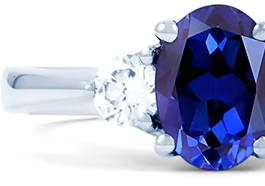 The fascinating world of gemstone rings is at your fingertips here at Diamond Boutique. An incredible collection of natural gemstones boasting outstanding colour and character have been handpicked for their breathtaking beauty and crafted into jewellery designed to last a lifetime. Explore our collection and discover vintage-inspired emerald rings next to curious pink sapphires and rare peridot rings in both gold and platinum settings. Looking for a truly unique gemstone ring? You can customise your ideal jewellery with us, selecting your own setting, stones and design for a ring as unique as the person wearing it.